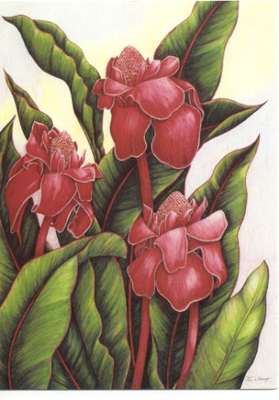 The Torch Ginger has stems with leaves that reach up to 6 feet tall. The bloom springs from a separate stalk and reaches approximately three feet. They usually bloom from March to July. These flowers come straight up on stalks without leaves and thus give the resemblance of torches. The leaves are on stalks which sprout separately from the ground and reach heights of over six feet. PR-3 21 1/2" x 29 1/4" (size of print) $60 Click here for ordering information. "I received the notecards won in last week's contest today. They are gorgeous and I appreciate them very much. Again, thank you very much. I keep looking at all the options on your site - maybe I can make Santa's job a little easier this year!!" "I loved the Prize, the cards are beautiful and the colors very vivid, you almost feel like you could smell the aroma of the flowers. They are great note cards that can be used for any occasion....almost too nice to send out a note to anyone in."